As mobile landscape in Kenya transitions from “dumb” feature phones to smartphones, the need for apps with local content grows every day. Apps enable consumers to discover what’s new around them, quickly order and use a variety of services, conduct transactions like shopping and financial management, the possibilities are endless. For Windows Phone Users in Kenya, the list of apps with local content is growing. IN an effort to make users aware of the apps, I compiled a list of the must have local content Apps for the Windows Phone platform. It is important to remember that the Kenyan App Economy is in its infancy; the developer’s skill base is growing, companies and business strategize on how to use apps to serve their customers, and consumers learn to recognize value in apps and thus purchase them. All these 3 components depend on each other to create a thriving app economy. I implore all of you to give feedback to the app developers and content owners on how their app helped you, or what areas they need to work on. We would love to hear your feedback about these local apps by tweeting us @NairobiWP, @Techweez, @NokiaEastAfrica or @MicrosoftEA, using the hashtag #KeepItLocalWP8. NOTE: Click on App Icons or App Title to redirect to the Windows Phone Store, or Scan the QR code to automatically download the app to your Windows Phone. An indispensable app for any M-Pesa consumer. Well designed and updated regularly. 2. What the recipient will be charged to withdraw the amount at an Agent or ATM. Finally, the app will show you the suggested amount to send so that the recipient does not incur additional charges withdrawing the funds from an authorized agent. One of Kenya’s leading banks, the KCB Mobile app allows its customers to perform various functions. 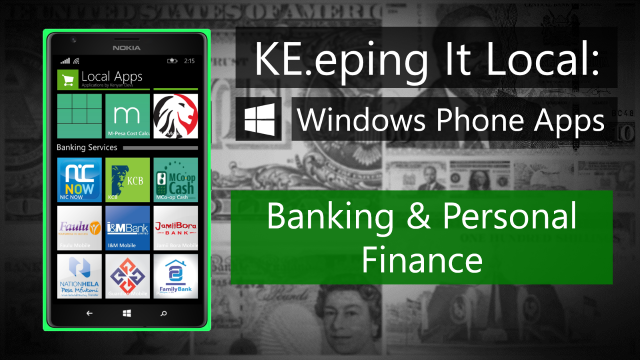 Kenya Commercial Bank’s (KCB) Official Mobile Banking Application for Windows Phone 8.KCB Mobile Banking Features – Send Money to Mobile Number, Buy Airtime, Check Account Balance & Mini Statement, Bill Payments, Cash Withdrawal at Agent & More. This app is specifically for Kenya Commercial Bank customers who have registered for Mobile Banking Services. Keep on top of your investments in the Nairobi Stock Exchange. NSE has put together a Windows Mobile application that provides users with Market statistics for listed securities, corporate actions that affect their securities holdings, and introduced a section called My NSE where users can see the market performance in real-time, as well as connect to their CDSC portfolio to see how the shares are performing in real-time. The tool also provides a virtual-Share portfolio tool that helps users track specific counters, and see how those counters would perform, showing some real scenario with end of day market data. NOTE: All Apps with * are developed by Craft Silicon.